Education Qualification : Passed 3 Year Full Time Engineering Diploma or B.Sc/B.Lib in Concerned Discipline/Subject/Branch from any Recognised University/Institutions. (Note- For More Details of Eligibility Applicants must Read Official Notification before Apply). 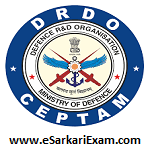 Eligible Candidates can Submit Application at the Official Website of DRDO latest by 13th Sept 2018. Open CEPTAM Notice Board Links at Home Page. Click on CEPTAM 09/STA-B Advertisement Link. Now Click on Online Application for CEPTAM 09/STA-B Link. Click Proceed Button and Fill up Registration Form.